Streeter Lecka/GettyNCAA commissioner Mark Emmert. The NCAA announced reforms to college basketball geared to clean up the system and help players looking to go professional. The reforms include allowing players to sign agents and allowing players who don’t get drafted to return to school. Many of the changes, while positive in nature, were largely criticised as half-measures that either won’t help enough players or will cause new problems. 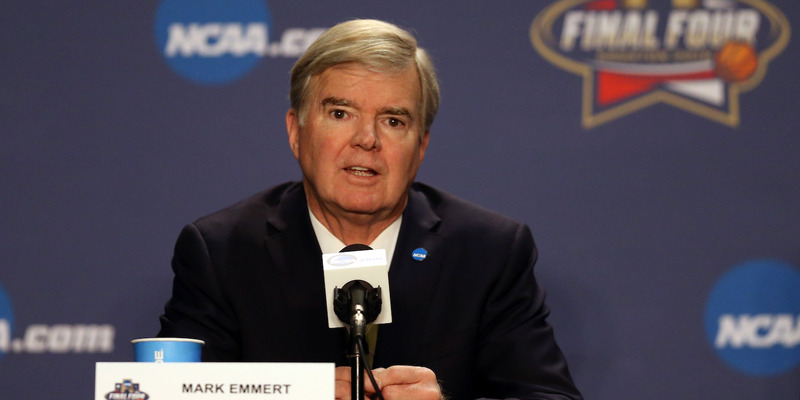 The NCAA on Wednesday announced a set of reforms to college basketball meant to clean up the system and help potential professional prospects. But some critics said the proposed reforms amounted to half-measures that wouldn’t solve or even create new problems. Among the most notable changes is that the NCAA will allow college basketball players and “elite” high school prospects to sign with an agent – but only on a temporary basis. Per the NCAA’s announcement, a player’s relationship with an agent must be “terminated when the student enrolls in or returns to college.” According to Dan Wolken of USA Today, players can only hire agents at the end of the season, meaning that agents will only have a tiny window of time in which to advise players on the best possible decisions for their futures. Furthermore, according to reports, only “elite” prospects can hire agents. According to college hoops writer Jeff Goodman, the proposal would allow USA Basketball determine which prospects are “elite,” leading to another set of potential problems. Here’s another concern about USA Basketball basically choosing who is allowed to be repped by an agent in high school. What if a kid doesn’t want to play in the USA Basketball system? Does he get hurt by that. The proposal reportedly caught some in the NBA by surprise. USA Basketball reportedly did not pass off on the proposal. Another reform would be geared toward the draft status of undrafted players. Previously, players who wanted to test the professional waters could go to the combine and decide to enter the draft or return to school within 10 days after the combine. The new rules allow players to return to school if they go undrafted, but only if they’re invited to the combine. “College basketball players who request an Undergraduate Advisory Committee evaluation, participate in the NBA combine and aren’t drafted can return to school as long as they notify their athletics director of their intent by 5 p.m. the Monday after the draft,” the organisation announced. However, this reform would only benefit a small number of players. Matt Babcock, a former NBA agent who has worked with players during the pre-draft process told Business Insider that the changes simply won’t effect many players. Some criticised this narrow scope of players that the changes would affect. Basically, this “undrafted kids can return to school” thing is limited in scope. It’ll affect potentially 20-25 kids a year, tops. Key context on “kids can return to school if undrafted” is this: it only applies to players with NBA Combine invites. NCAA cites research that shows players with combine invites almost always get picked. So this new rule will almost never be taken advantage of. Other changes related to investigations, recruiting, and academics. One adjustment that did receive positive feedback is a new rule that Division I schools pay for tuition, books, and fees for players with scholarships who left school and returned within 10 years earn their first degrees. However, by and large, many felt the reforms wouldn’t do enough to change the system. The NCAA announced some good changes today, but significant progress cannot be made without striking at the heart of the problem exposed by the FBI investigation: The Amateurism model.